This afternoon the Fed raised interest rates by 25 basis points, i.e., .25%. Certainly a quarter point hike in rates should not have a significant impact overall. However, the economy does seem to be shifting into a lower gear. One note of caution is the industrial production report this morning. The report shows the first year over year decline since the end of the last recession. 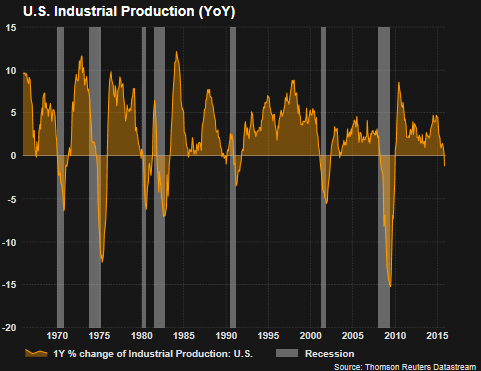 As the below chart shows, a negative reading on industrial production nearly always occurs around recessionary periods. Econoday's report on the release contained a couple of highlights. November was another weak month for the industrial economy, in part reflecting unusually warm temperatures that are driving down utility output. Industrial production came in down a very sharp 0.6% in November. This is the biggest drop in 3-1/2 years. Utility output fell a monthly 4.3% after falling 2.8% in October. Mining, reflecting low commodity prices and contraction in energy extraction, has also been week, down 1.1% for a third straight decline. This brings us to the most important component, manufacturing, where October's 0.3 percent bounce higher (revised downward from 0.4 percent) now unfortunately looks like an outlier. Manufacturing production came in unchanged in November reflecting weakness in motor vehicles, down 1.0 percent in the month, and also a dip back for construction supplies which fell 0.2% after a weather-related surge of 2.3% in October. One positive is a slight snapback for business equipment which, after declines in the two prior months, rose 0.2%. All the weakness is pulling down capacity utilization, to 77.0% in November for a heavy 5 tenths dip. Utilization is running more than 3 percentage points below its long-term average. Mining utilization is now under 80%, down 1.1 points in the month to 79.4%. Utility utilization fell 3.4 points in the month to 74.5% with manufacturing utilization down 1 tenth to 76.2%. Excess capacity, though not cited as a major factor behind the lack of inflation in the economy, does hold down the cost of goods. This poor reading on industrial production is occurring in an environment where the U.S. economy is growing at a below trend pace. The weak industrial production number could be an indication of slower economic growth ahead. The industrial production and related capacity utilization figures are considered coincident indicators, meaning that changes in the levels of these indicators usually reflect similar changes in overall economic activity, and therefore gross domestic product (GDP). The release will shed light on short-term rates of change and business cycle growth. 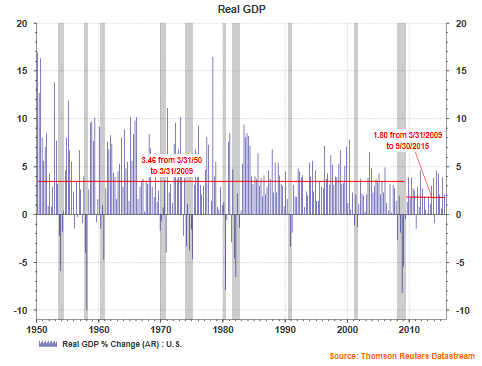 As the below chart notes, economic growth since the end of the financial crisis has been running nearly 50% below the average growth rate of the economy since 1950.